The 'Avulsion' had swept away the old world. It is now up to the Lords of Mythotopia to forge a new one. As one of the feuding lords of Mythotopia you have inherited a number of provinces scattered to the four points of the compass. To succeed and emerge as the First Lord of Mythotopia, you must expand your empire, build roads to connect your provinces, grow towns into cities, enter lands haunted by ancient dragons, and hold back the armies of those who would oppose you. 'Mythotopia' is a fantasy-themed board game for two, three, or four players, with a playing time of around sixty to ninety minutes. The game is a development of the award-winning deck-building game 'A Few Acres of Snow'. Starting locations, available Improvement cards and victory conditions are determined randomly at the start of each game. Consequently, no two games will ever be the same. If you like the idea of a deck-building board game that offers fresh challenges and situations, then this is the game for you. This game contains a set of English, French and German rules, along with a single-sided full-coloured mounted map, four counter sheets, one hundred and ten playing cards, four wooden pieces, one English Player Aid Card, one French Player Aid Card, one German Player Aid Card and a number of grip-top bags for storage. 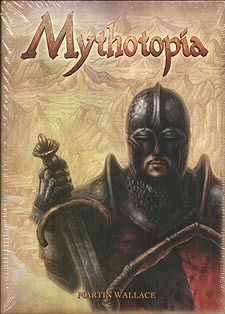 Know it's been out a while, but only just got round to the great experience of playing Mythotopia. Already a fan of Martin Wallace's designs, but for me this is one of the best. These are highly accessible rules and the action flows right from the start. Though not normally a great fan of drafting games, this is not the sort where you spend hours crafting your deck before even getting to the table. The drafting is done in game largely by adroit use of your Reserve stack and the fact that your basic hand of five cards are quite likely to be consumed by a single turn’s play. So, working through your deck is not a laborious process. Always have liked a game too in which starting positions are randomly determined each time you play, but in this game you also combine fixed VP cards and four variable ones drawn from a set of nine and have a set of 27 Improvement cards from which 16 are drawn for purchase in the course of the game. This mix allows for plenty of variability in each game you play. The colours on the board and those of the cards that are the engine that drives the game may not be the most startling, but I find the line drawings on the Improvement cards especially appealing. In addition, all the location cards from which you will draw those that form part of your starting deck, as well as determining where your initial towns are placed, have the excellent feature of depicting a map to help you easily locate places. Helpful enough in a real world when your geography is sometimes hazy, in a mythical world it’s downright essential and a simple, but major benefit to ease play. But more than anything, game play is fast and absorbing with little down time. Playing with the maximum of four can be a bit chaotic, but as a two-player, I think it excels. time. Playing with the maximum of four can be a bit chaotic, but as a two-player, I think it excels.